Depending on the severity of in-utero infection, late abortion, stillbirth, neonatal death, neonatal disease or latent infection may occur. In the peri-natal period, rhinitis followed by a maculopapular desquamatative rash are classic external signs. Severe hepatitis and osteochondritis/periostitis are common. 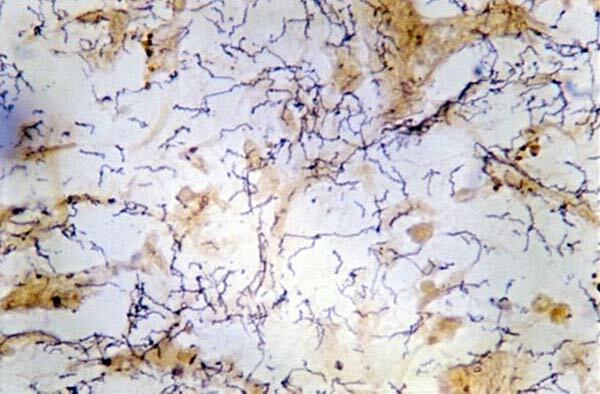 Untreated children who survive enter a latent period and go on to develop the late lesions of syphilis, a result of chronic inflammation of their bones, cartilage, eyes, ears and internal organs. 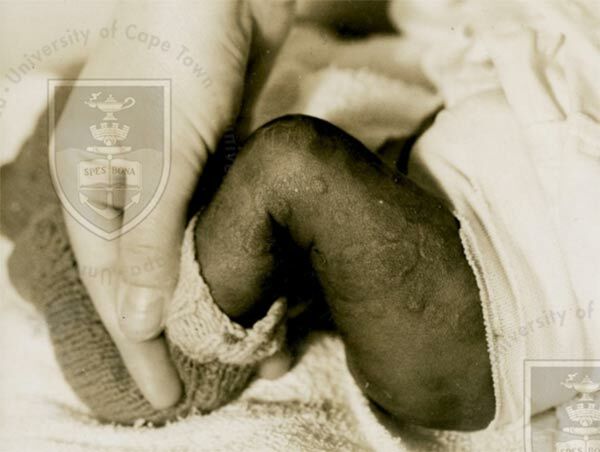 Congenital syphilis: rash at 7 days, year 1949. 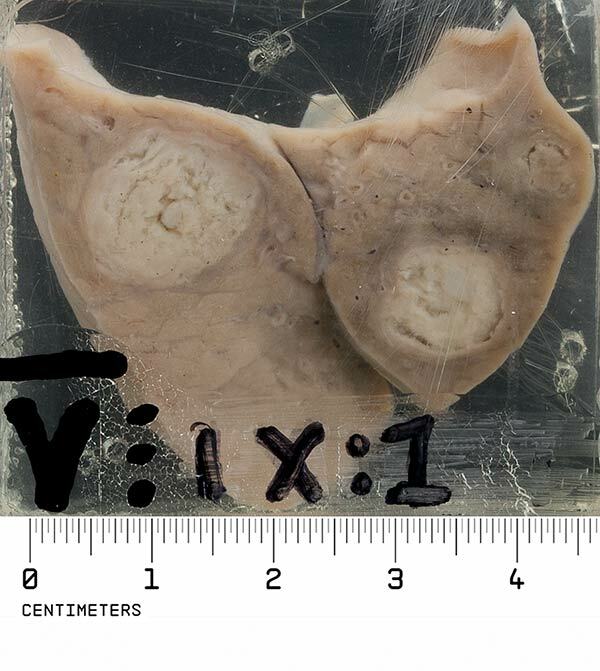 This specimen is from a pre-term 28 week infant, whose mother had a positive VDRL. The child died some 20 minutes after birth. At autopsy, both lungs contained large gummatous lesions with necrotic centres. Gummas are an unusual finding in the neonatal period; they are typically a later manifestation of congenital disease. Spirochaetes in a section of liver from a patient with congenital syphilis, Warthin-Starry stain. was the result of an accidental infection of a midwife - year unknown. Stigmata of late congenital syphilis in a girl at age 16 years, year 1942. 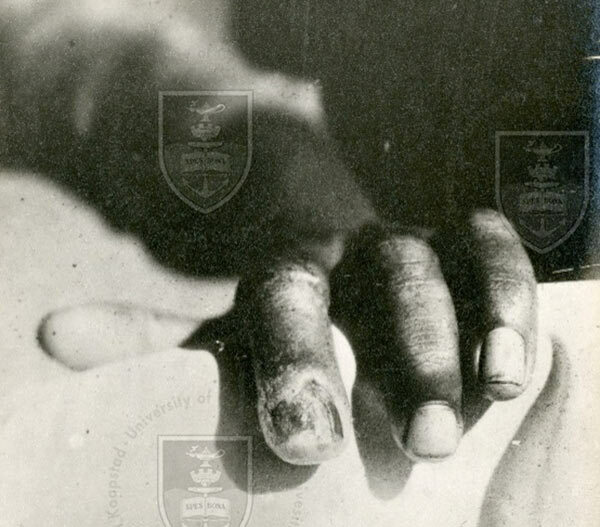 Stigmata of late congenital syphilis in a boy at age 15 years, year 1943. Saddle nose, Clutton’s joints, Hutchinson’s teeth and chronic interstitial keratitis i.e. chronic, nonulcerative inflammation of the corneal stroma (the middle layers of the cornea), without involvement of either the epithelium or endothelium. This specimen of tibia has well marked, irregular cortical thickening involving the middle two-fourths of the bone. The thickening is more marked anteriorly than posteriorly. The medullary canal is narrowed. 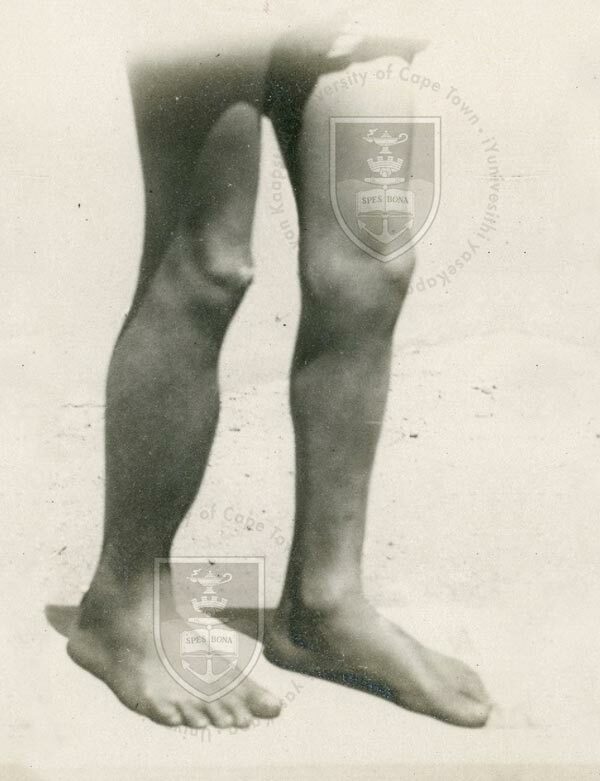 The tibia is slightly bowed anteriorly and the overall appearance is that of the classical sabre tibia, one of the late stigmata of congenital syphilis.